An acoustic set with the Landladies re-imagining their favourite songs on double bass, accordian, ukulele and grand piano? John Coltrane meets the Bee Gees, The Supremes as played by Santana. ?Multi instrumentalist Charlotte Glasson will restore your faith in jazz. Witty, exhuberant & genre defying stuff.? @LocalSCambridge. 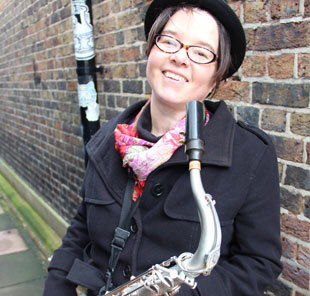 Charlotte Glasson is a multi instrumentalist and composer, who runs her own award winning band drawing on many influences including Kwela, Gyspy jazz, New Orleans and Latin music. Charlotte has played all over the world including Sydney Opera House with The Lost and Found Orchestra,, BB Kings in New York with prog band Three Friends, and Bangkok Music festival with Claire Martin. With Dan Hewson on piano, showcasing tunes off their CD Shadow Dance.